In this tutorial the object that I use is the crane and the track is Interlagos. 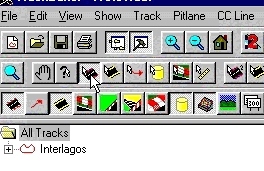 First you must select the track selection button. If you want to put in a new object click once with youre left mouse button on the track section where you want an object. Next click with your right button on the same track section and you will see the following. Click on Insert Track Object then you see the Object Position Dialog. Now we choose 912 in the Object Description Offset, then we must choose where the object must be placed in the track section. The track length in the example is 4, so the value of Distance From Start of Sector must be between 0 and 4. 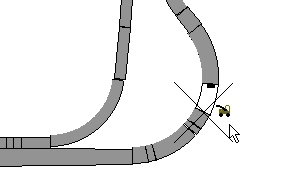 Click on OK and the Object is in the track. If you change the value in Distance From Start of Sector further then the track length is and the object is placed in a corner then the object follows the angle of that corner. See the example below her is the value 18. How do you find the code of the Object? Click in the menu Tables/Object View and you see the value of the crane I use. You cant place two Objects at the same Distance From Start of Sector in the same Track section! 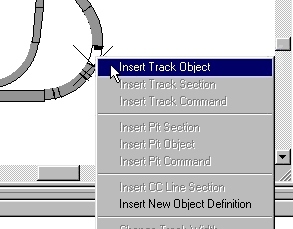 Then only one Object is placed in that track section. The other Object you can't see in the track. button in the Object Position Dialog. 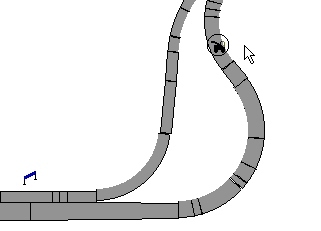 Then you get in the Track Object Definition Editor. AngleX: With the AngleX you can turn the object. You can give another value between 0 and 65536, the object turns then between 0 and 360 degrees. AngleZ: With the AngleZ you can turn the object upside down if you want. If you change the values all the objects with the same Object Offset will be changed, if you want a another see D. New Object Definition. Object Selection: ID1 is the ID of the object you will be using. ID2 is sometimes needed if you want to place trees or bushes, ID1 is then most of the time 5,ID2 is then between 84 and 129. Unknowns Detail: This is connected with the alt+d keys. There are different values between 0 and 256. There are 4 values discovered. There are two unknowns Unk1 and Unk2, for this moment we don't know what they are doing. In the TE 1.6.0. is it some times possible to import/export objects. It's more "trial and error". Maybe is this also possible in the TE 1.5.7. but I don't check this. First go to the Internal Object definition tree, click with your right mouse button on the object you want to export. Then give a name you will use for this object. Go to the track you want to import the object, go to the menu Object/Jams-Insert New Internal Object, go to the directory where you put the object and select the object you want to import. Then you will see in the Internal Object Definition tree the new object. You will also needed the Jam files that the object use. Paul say this in the Track Editor Forum. to export now right click and select Export 3D Object. we'll cross that bridge when we come to it! If that works, I'm a monkeys uncle! If you succeed to export/import the object you can make a New Object Definition. Go to the Object Position Dialog and click on the New Desc.. button. Then you will see the following. Normal the Object Ofsett will be automaticly, now put all the values you want to use in the Track Object Definition Editor. The ID1 you can choose as you see in the example above (Not available in the TE 1.5.7.). Click on OK and the new Object will be in the Object Definition tree. only one way and its abit hidden I'm afriad. destroys the track.. so make sure you SAVE everything! but I can see why we can't alter an old one! 2. Next look below, double click on the highlighted "internal object definitions"
You can choose any object you want but in this case I've selected the Flyover highlighted above. To edit this you must double click it. 4. Now this is your screen. 5. Now click once on a texture as shown, And then look at the bottom box. We can see in the bit highlighted that the texture id "240" is selected. Now Change the value to another, in this case we'll choose "180"
N.B. If you double click on the texture in the above menu it will not save the texture so you must change it in the below menu. Also after changing the id below you must press enter to make it stay at that number. a. Scroll down the page until you can see the word "texture data" and double click it. b. Now we know that the value we changed before was 240 before we changed it so now we want to find that number. Here that happens to be in number 6 so double click it and you will see the word "Texture?=240" The 240 means you have the right texture, so click once on it. c. This is what you will see in the bottom box, above we changed this 240 to 180 so here we do the same. It is very important that you change the value in both places and then save it. Also the changed values may not appear in the top-left menu until you press F5. Chooseing the right object is simple, first on the track menu double click on the object you want to edit. Now in this screen look for id1=23 as the first piece of writing. Easy eh? If you find something hard to understand e-mail one of us and we be more than happy to help you, Also email us if you find this tutorial easy to understand and very informative to praise me and let me know how great I am. Only messin' but let me know what ya think. Soon the Tutorial will be updated with Object Shape Editing.